Uh oh, Stanley! Double foot fault! This entry was posted on June 25, 2014 at 8:17 am	and is filed under Other Dogs, Stanley. You can follow any responses to this entry through the RSS 2.0 feed. You can leave a response, or trackback from your own site. Even with Stans foot fault, much better behaved than our furry horde! But who can penalize the foot fault with sweet faces like that?!? 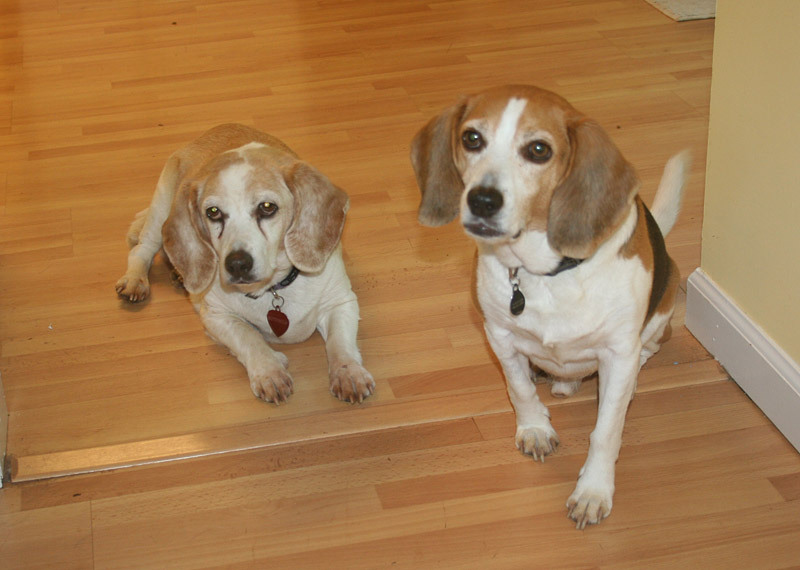 Poor babies are starving – only a beagle can give that look! I don’t think i counts, because girl dogs don’t have “something else”. Advantage Mr Kramer …………… sorry, we have Wimbledon on at the moment! Stanley with eager anticiplation. Buttercup faking disinterest! If a beagle can get ANY advantage for the next morsel, they will take it! Thanks for the smiles. It has take me since April1st to be able to look at the DD. That is the day we had to put our dear sweet Lucky to sleep. The vet came to the house, which was a major blessing. But it was her time. We had her for 12 wonderful years in her 14 year life. Again, thank you for providing such a perfect view into the life of a beagle. Glad to have you back, Marci! It’s always tough, we’ve all been there. And yes, mobile vets can be a blessing! A friend just had to put down her miniature poodle yesterday, and since it was bladder cancer, she had time to make plans and look into a mobile vet service. He always freaked out when he had to go on car rides, and then would stress at the vet’s office. She said it was such a blessing that his time to pass didn’t have to include that extra stress and anxiety for him. Thanks for giving Lucky a wonderful and loving home! Thanks all. It feels good to be back and smile again!